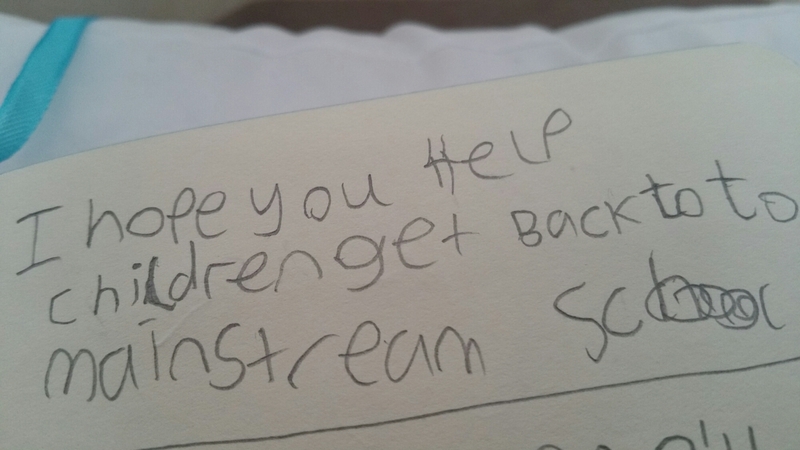 I am finding myself referring a lot to ‘my new life’ or ‘my new world’ post PRU, but in truth it is not very different to my old one in terms of being there for schools and helping children! So what has been happening? I don’t want this blog to come across as just a blueprint for setting up your own business but actually good forward planning and organisation are key. It has taken me many months to get my business together and a fair financial input too! Whilst I was still at school I concentrated on infrastructure. Finding the right name was extremely important. I decided to be a sole trader and I wanted something catchy but not jokey, and definitely nothing with ‘solutions’ or ‘inclusion’ in it, important as these are. Actually I don’t feel I have * solutions* , I have actions that are worth trying which, in my experience, are often successful. ‘Solutions’ suggests that you are there to make problems go away without much input from school needed!! I wanted something personal- sounding rather than corporate, and it needed to stand out from the crowd! 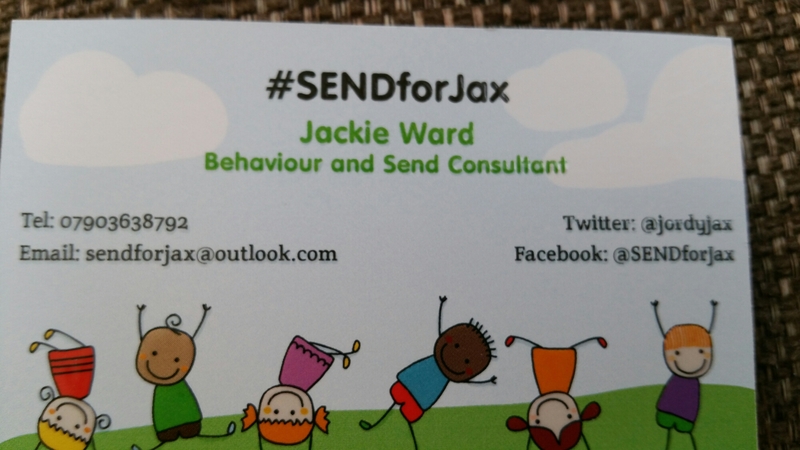 I came up, finally, with #SENDForJax and I am very happy with it as it emphasises my core purpose….helping children with behaviour and SEND (with a twitter hash tag for good measure). I hired an accountant early on because I wanted to ensure everything was done properly; I have taken early retirement and so my pension needs to be factored into my accounts….this is my safety net at holiday times or if I am ill. I opened a business bank account and my business manager (son) had training on an accounting program to manage my invoices etc. (unpaid bless!). A good computer is essential and so is my indispensable Surface laptop/tablet…they cost a pretty penny but I am realising how much I need them now I am out in schools! I am writing a lot of reports and having the latest technology gives a really professional ‘look’ to them….don’t forget these reports are being read by a range of professionals so I do not want to come across as amateur hour! There are so many things to think about…I have taken out business indemnity with public liability…..I needed a sponsor for a new DBS certificate (fortunately my PRU agreed to do this). I needed an identity via business cards and other goodies. My son sorted me out a fab logo and I have a magnetic sign for my car too which I love. When I finished work I spent a lot of time converting a downstairs room into an office. 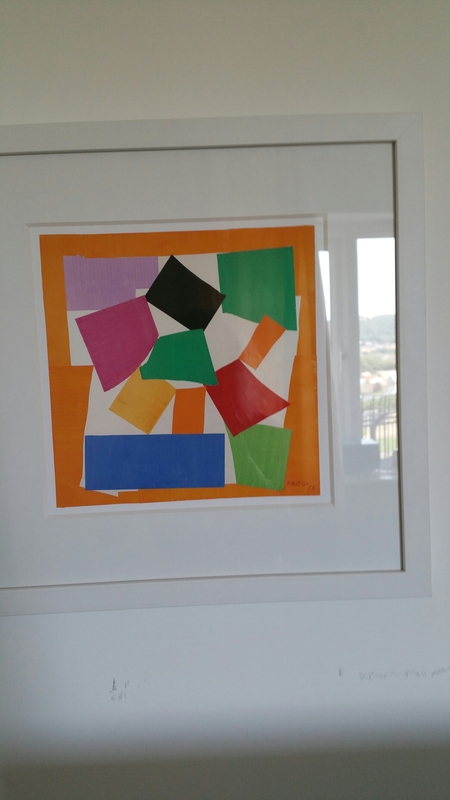 I have to say I adore it and I bought ‘The Snail’ by Matisse print to go on the wall….it reminds me of being a class teacher and many an art lesson ( keeps my feet on the ground), but is also symbolic as there are no quick fixes when helping challenging children with SEMH and underlying SEND.Like the snail, a good practitioner will be careful and methodical and leave a clear trail of evidence to get the right result! Once September came it was all about marketing….emails, delivering cards, having conversations with people I knew, and also networking with other businesses; I felt in this new, uncertain world I needed to keep my options open and twitter and Linked_in have helped as there are opportunities to branch out a bit once I am more established. 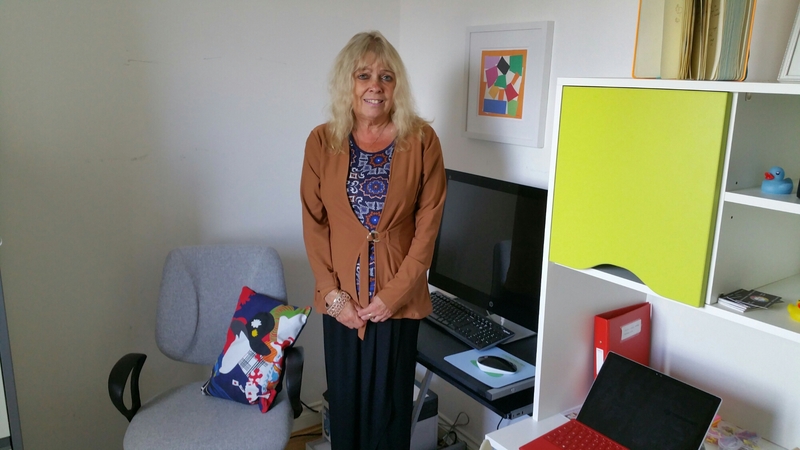 I have also employed someone to do my website which is now crucial…I have found that trying to move into new geographical areas is difficult because I am unknown; at times I have felt like a double glazing sales person rather than an experienced behaviour and SEND professional! So I need my website to validate me ….good references and testimonials are a must! My core purpose for the business is to help children and schools and prevent exclusion if possible but I need to live! I had lots of thoughts about my charges and settled on what I felt was a reasonable hourly rate. However the reality is that budgets are tight….I cannot operate if no one can afford me! So I have settled on supply rates plus and this is getting me into schools. Now I am in I am realising how hard it is and the sacrifices schools are having to make to stay within their means….but they desperately need assistance…one Acting Head is also SENCO and has been doing the job on deputy salary for months…TA hours are being stretched and even cut, so there is little support for vulnerable children….the demands of SEND are implacable, schools are struggling with EHCP paperwork and it is now so exacting that many hours of time, both from SENCO and SLT, are needed if referrals are to be successful. I am experienced with the procedures from my time as deputy/SENCO at my PRU but it took me a full day (and evening) to sort out a mainstream referral in a school where the SENCO is a deputy with mostly full time teaching in a Y6 class! It’s an impossible task on top of everything else! And getting worse! However, there are statutory duties and as a specialist teacher I am trying to help by keeping my costs low without selling myself too short. And yes, despite the difficulties, it is so rewarding. I love the different challenges and the variety. In a few short weeks I have done specialist teacher reviews, EHCP paperwork, BOXALL analysis with future training planned, observations of individual children with practical strategies, support for new SENCOS, support for Heads and there is more in the pipeline! My best moments this week came when I prevented the exclusion of a CLA boy by finding the Head some extra money to support his needs and when I took in a wobble cushion for a little one who has core body strength issues (she is awaiting a paediatric appointment and I will be supporting mum as she struggles to communicate her daughter’s needs to health professionals). The little one’s face was a picture and the head and staff were delighted! The head has emailed since and said C loves her special cushion! I love being able to add a personal touch in my new world! For anyone thinking of doing this, it is hard because you are living from week to week initially….often I have thought I have nothing coming in but then an email comes in that saves the day! I am booked in for a slot at a heads’ cluster in November, with a warning to be short and sharp before heads start looking at their watches! ( busy people!) so I am hoping that word will spread and I can stay busy! However, Rome wasn’t built in a day as this reminds me.